Kim is hosting our challenge today, and the theme is Animal Magic. We would love to see your creations based on an animal theme. Please make sure that your project has an animal large enough for us to see, we are excluding insects in this one, so no bugs, butterflies, bees etc. will count as animals. Your project may still have them, but not as the animal, so you will need to add something other than an insect to meet the challenge theme. 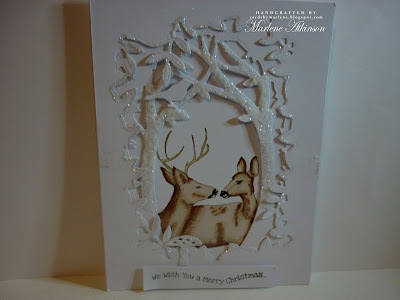 As usual anything you care to enter is fine, a card, scrap layout, mixed media piece, some home decor, as long as it's matches our Animal theme. 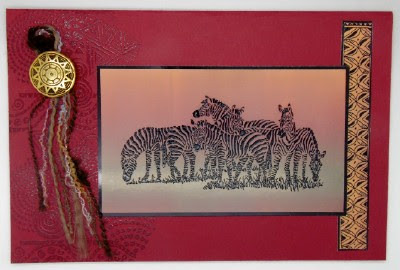 I chose to stamp a dazzle (yes, that is what you call a group of zebras according to Google!!) of zebras for my Animal themed card. 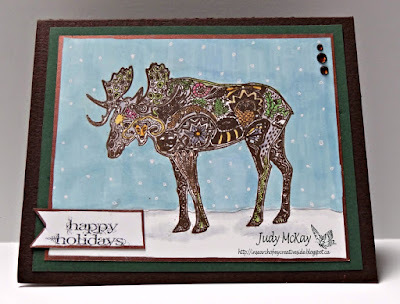 A variety of inks; Distress, Memento and Versafine, masks and stamps from various manufacturers and a wintry landscape is the result. I used an old rubber stamp from my collection of a Moose by a company called Earth Art. I used Copics, Pitt pens and a gelli pen to colour my image then added a few gems, glitter and sentiment to complete the card. 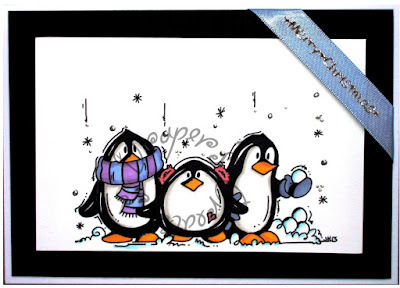 I have used a Bugaboo digi called winter penguin trio and coloured it using Promarkers, adding Liquid Pearls to the falling snow. 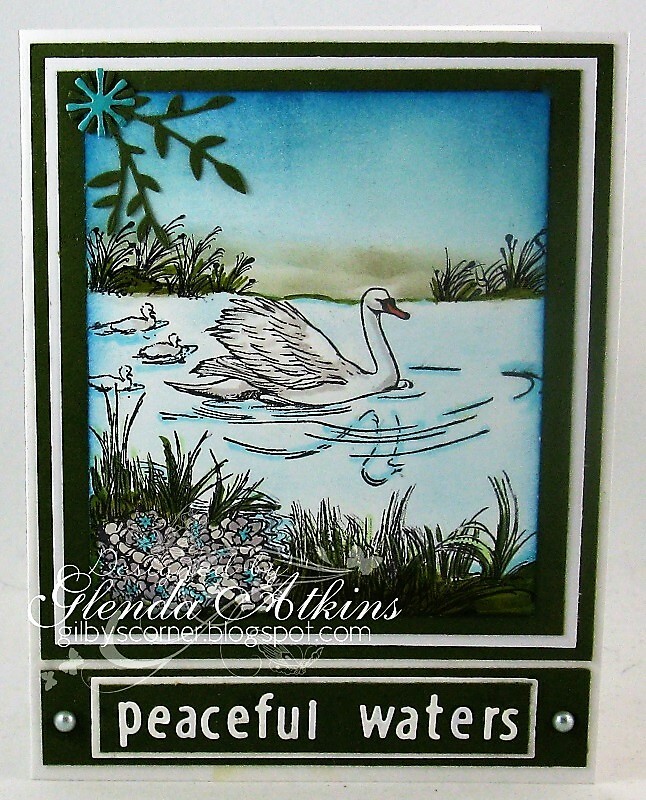 I created this card to show the magic sight of a mother and her young on a peaceful lake. 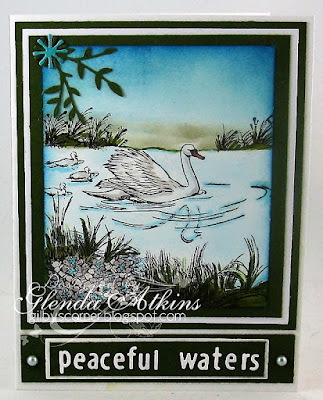 The swan and the lower foliage were ink stamped and the sky and water is hand sponged.. I have used these cute mice from a rather new Gerda Steiner Designs set. I love their content little faces. For the background scene I created some hills with Distress Inks and added a wooden house free hand using Copics. My card was made with layers of paper, lace, tulle and string. The little reindeer is a chippie from 2Crafty Chipboard and to this I have added a bauble sentiment from Scrapmatts and a cluster which includes a handmade poinsettia, a tiny pine cone and some die cut branches. 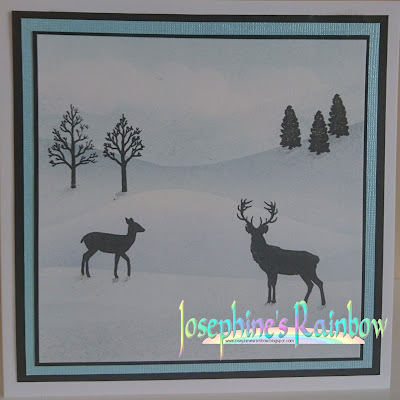 Hello, today I want to show you a winter scenery card with lots of layers and snow. 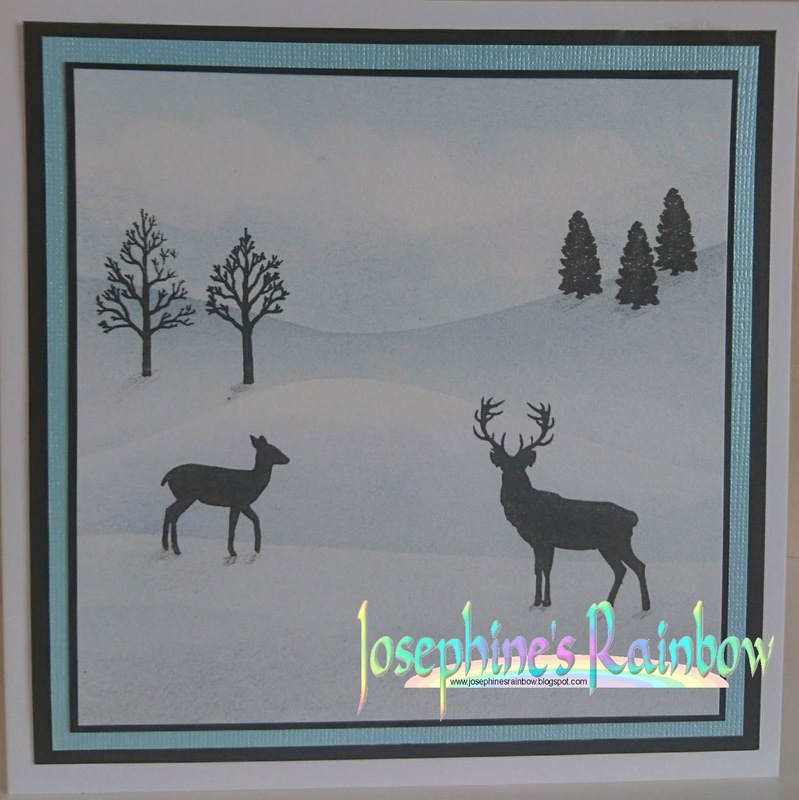 I added lots of trees and lovely deer and doe. Sentence: warm family Christmas. Hugs. Thank you for the fun challenge & great DT inspiration!